24-Hour Emergency Service | Hose & Fittings, Etc. Sign up for our 24-Hour Emergency Service Program and have access to our parts when an emergency strikes. If you need any of our products or services after business hours, call our emergency number to reach one of our store associates. An associate will meet you at the store within an hour of your call (or as agreed upon) and provide you with the same great service as always. We do not keep any cash in the store after hours, and we cannot accept cash payment after hours. Your purchases can be charged to your open account, a credit card, money order, or a company check. 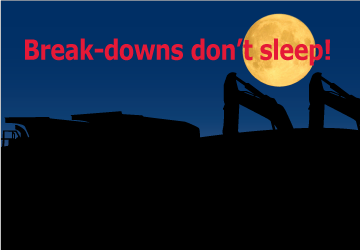 Sign up for our 24-Hour Emergency Service Program and have access to our parts when the emergency strikes. We will email you an application. Usually we can have you set up in a day or two.